We all need sodium to stay healthy. Sodium is an essential mineral that helps regulate blood pressure. On the other hand, excess sodium in the diet may cause high blood pressure (hypertension) and heart disease. With a wide variety of store-bought foods containing high amounts of sodium readily available to us and all the dining out we do, it’s easy to surpass the recommended daily amount of sodium. So it is important to closely monitor salt intake and perhaps cut back on salt, but this is generally easier said than done...particularly for certain people (including myself). Research from Penn State University suggests that genetics may have an impact on how much salt (and other flavors) we taste in food. John Hayes, assistant professor of food science and lead researcher, summed it up perfectly. He explained that there are supertasters who live in a “neon food world,” so flavors are more intense to them. And then there are nontasters who live in a “pastel food world.” The flavors they taste are more soft and less intense. Bitterness in certain foods tends to also be more apparent to supertasters, and salt is often something supertasters use to combat bitterness. “Most of us like the taste of salt. However, some individuals eat more salt, both because they like the taste of saltiness more, and also because it is needed to block other unpleasant tastes in food," Hayes said in a report. "Supertasters, people who experience tastes more intensely, consume more salt than do nontasters. Snack foods have saltiness as their primary flavor, and at least for these foods, more is better, so the supertasters seem to like them more." But nontasters may end up adding more salt to their food since the taste of salt is less intense to them. Either way, supertaster or nontaster, it looks like we have to watch our salt intake. “Those conclusions are important because recent, well-publicized efforts to reduce the salt content in food have left many people struggling to accept food that simply does not taste as good to them as it does to others,” according to Hayes. It’s easy to just tell us to not eat so much salt or to toughen up and accept that some foods are just going to be bland. But honestly, it is hard for most of us to sustain good eating habits if we feel like we are being punished. So the best course of action is to find ways to eat healthily without sacrificing flavor. A recent report discussing the U.K. government’s new healthy strategy targeting salt, has some invaluable pieces of advice and information. Fortunately, it appears that in some cases the food industry is getting on board and being sensitive to the fact that many people need to watch their salt intake. “One approach the food industry has taken is to change the size and shape of the salt particles so that more of them reach the receptors on the taste buds on the tongue. This addresses the lack of salty taste when the amount of salt in processed food is reduced. But a different approach is needed to address the lack of overall flavour,” according to the report. As the pH health care team continually suggests, cooking most of your meals at home from scratch is the best way to go. 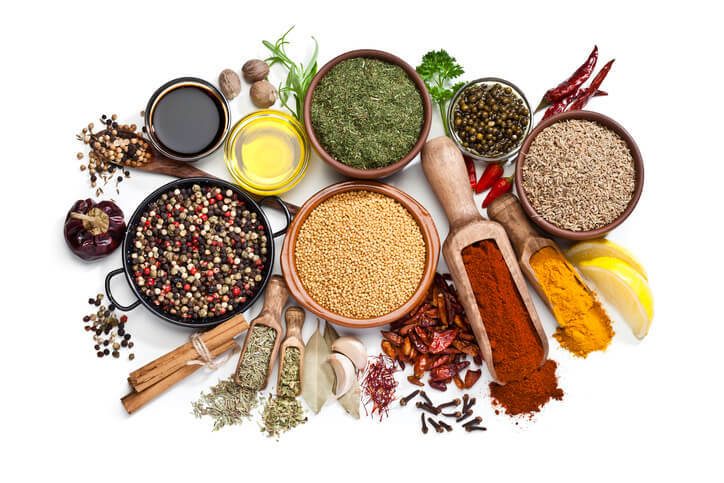 You can make up for a lack of flavor by seasoning your foods with aromatic spices and herbs like basil, cilantro, parsley, cumin, sage, dill, ginger and more. Think of these herbs and spices as being your secret weapons. Not only will they enhance the flavor of home-cooked meals and help you reduce the amount of salt you use, but they also contain a lot of essential vitamins and minerals such as calcium, potassium, folate, phosphorus and more. “Another trick is to add foods that contain natural flavour enhancers, such as tomatoes or parmesan cheese, and combine these with low-salt soy sauce or tiny amounts of fish-based sauces, such as Worcester sauce, which contains anchovies. This works well because the nucleotides found in the fish and in the soy sauce work together with glutamic acid found in tomatoes or in cheese to give a more powerful savoury flavour,” according to the report. If you already have high blood pressure or need to watch your salt, consult a competent healthcare professional about using low-salt soy sauce and fish-based sauces. They still contain sodium, so it’s best to see what’s specifically appropriate for your diet. It also appears the less salt you consume, the less you will want it. The same goes for sugar. Think of them as addictive substances that should be consumed in moderation or maybe not even at all. Know What’s In Your Supplements. “If you routinely take an effervescent (dissolvable) vitamin supplement, or take effervescent painkillers when necessary, it's worth remembering that these can contain up to 1g salt per tablet. You may therefore wish to consider changing to a non-effervescent tablet, particularly if you have been advised to watch or reduce your salt intake,” reports the National Health Service (NHS). Always consult with a professional when it comes to taking supplements, and speak up if you’re concerned about the amount of salt you are consuming.